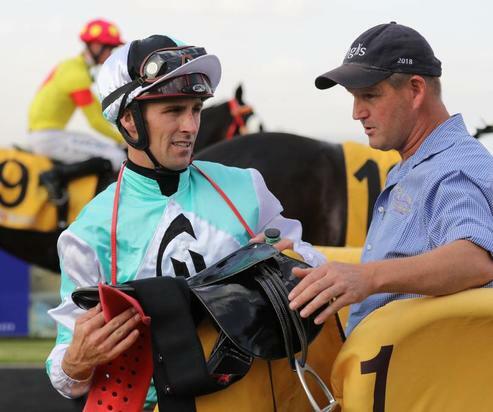 Wantabadgery wonder Tye Angland all but lifted Class Clown over the line as the pair combined for another Wagga carnival victory on Thursday. For the second consecutive year, Angland went to the front on Class Clown and produced a brilliant front-running ride as they took out the Bidgee Pumps & Irrigation Benchmark 65 Showcase Handicap (1600m). Class Clown was sensationally backed from $10 into $3.50 equal favouritism as Wagga trainer Chris Heywood and Angland again joined forces with success. Class Clown was headed halfway down the straight but, carrying 62 kilograms, Angland lifted the six-year-old to record a fighting half length victory. The Hayes-Dabernig trained Sonaree ($3.50) had to settle for second, with Bennelong Dancer ($4.20) a further length back in third. Heywood was thrilled to snare a carnival victory. “A win at carnival time, I will take any bit of that,” he said. “I know he had 62, but the rest of the field all had a fair bit of weight as well, so it wasn’t as much of a worry. Heywood did not mind Angland taking the initiative and going to the front, like he did 12 months ago. “It didn’t worry me,” he said. Angland was pleased to win on the horse again. “It was this day last year too,” he recalled. Class Clown took his record to six wins from 23 starts, and $90,000 in earnings for Heywood and Craig Hardy. It continued a good day for Heywood, whose two-year-old Prose “n” Cons ran third in the Inglis Bonus 2YO Showcase Handicap (1200m) at 200-1. Heywood also had Kruanui ($20.00) run second in the final event of the day, the Harrisons Joinery Class Two Showcase Handicap (1400m). The Heywood stable will have another six runners on Gold Cup day, including last-start winner Wolfofpeterstreet and the talented Delivered. Heywood expects Fermanagh Lad to run a big race in the Benchmark 70 Handicap (1200m). “I know it’s a hard race but he’s going super,” he said. Fermanagh Lad will be ridden by Blaike McDougall.